FIU has designated five university programs as “preeminent,” a recognition of high-caliber, collaborative work that generates unique learning opportunities, pioneering research and meaningful engagement with the external community while expanding the university’s financial base. This is the first in a series of articles that explores these programs in greater depth. Click here to view an interactive chart explaining each preeminent program. When Atorod Azizinamini stood in the White House in 2015 to be honored as a “Champion of Change,” he formally accepted a title that many agree has described him for years. With four patents and more than 200 articles to his credit, the chair of the Department of Civil and Environmental Engineering boasts a long history of impacting his field, first by working in industry and then spending two highly productive decades at the University of Nebraska, Lincoln, before landing at FIU in 2011. His expertise: building bridges fast. “The best way I can describe him is as an innovator,” says Monica Starnes, a senior program officer at the Transportation Research Board of the National Academies of Sciences, Engineering and Medicine. She worked with Azizinamini when Congress established a $232 million highway research program in 2006. Azizinamini was the principal investigator leading an initiative that resulted in his developing the definitive government guide for enhancing the service life of bridges through design, construction and maintenance. Azizinamini shows no sign of slowing down in his drive to make impactful changes that benefit society — nor can the nation afford to let him. More than 25 percent of the country’s 600,000-plus bridges are older than the 50 years for which they were optimally designed. Data from the 2016 National Bridge Inventory indicates that nearly 56,000 bridges are “structurally deficient” — deemed safe for travel but in need of renovation or replacement — and another 74,000-plus are “functionally obsolete” — inadequate for current traffic demands or unable to accommodate oversized or emergency vehicles. Azizinamini arrived at FIU with the goal of establishing a federally funded center to make aging infrastructure safer. The university quickly provided $50,000 in seed money to jumpstart the effort. Fellow faculty, industry professionals and a growing number of graduate students signed on. Then in 2013, the U.S. Department of Transportation put out a call to universities in a move to build increased collaboration with the Federal Highway Administration and the American Association of State Highway and Transportation Officials. “We heard that the secretary of transportation wanted new ideas, new innovations, something that can solve the problems and the challenges we have with the transportation system,” Azizinamini says. He prepared a winning $4.5 million proposal (and earned the federal designation “University Transportation Center”) around “accelerated bridge construction.” ABC, as it’s known, uses cutting-edge techniques that minimize onsite construction to produce environmentally friendly bridges that are safer and longer lasting than those built under traditional methods. Azizinamini understands well the negative impacts associated with traditional bridge construction: traffic delays, decreased mobility and work zone fatalities (resulting from more than 67,500 related crashes in 2013 alone), not to mention financial losses to local businesses and commuter frustration. Those solutions include alternatives to what has been, until recently, standard construction practice. Instead of closing down a major artery for months at a time to demolish an existing bridge and erect a new one in its place, state departments of transportation are increasingly looking at ABC. Options include constructing an entire bridge off-site and transporting it whole to its designated location for installation; building a bridge alongside an existing one and then, following demolition of the older structure, sliding in the new one; and a modular approach that combines factory fabrication with minimal construction on site. The research coming out of FIU supports, and even drives, the use of ABC nationwide as well as addresses myriad issues related to contemporary bridge making in general. Re-funded in 2016 (with $7.5 million over five years), the center continues to serve as the lead institution of a consortium that includes four other universities (Iowa State University, the University of Nevada-Reno, the University of Oklahoma and the University of Washington), each of which Azizinamini invited to participate based on a particular area of strength. 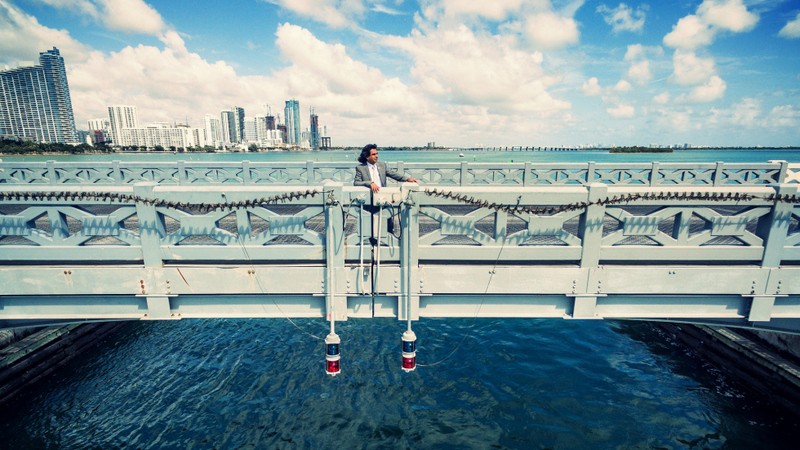 At FIU, researchers are working on dozens of projects, among them studies to develop prefabricated concrete bridge railings; to establish best practices and guidelines for demolition; to evaluate the feasibility of using sensor technology to monitor corrosion; and to develop a sensing system to monitor soil erosion around abutments and piers subjected to storm surge and sea level rise. From his years of working with Azizinamini in Nebraska, state bridge engineer Traynowicz understands the value of getting such research out to those who can best run with it. In addition to working with the state of Nebraska on several bridges, Azizinamini actively shared with officials and engineers the knowledge he and colleagues had gathered. Today Azizinamini uses a bigger bullhorn to reach a larger audience. He hosts monthly webinars that attract as many as 4,000 participants at a time, including folks in both the public and private sectors. In many cases, whole departments huddle together to hear state engineers and project managers share their experiences on specific projects. (The titles of recent presentations include, among others, “West Virginia’s Basnettville Bridge Lateral Slide,” “Ontario’s Rapid Installation of Single-Span Bridges” and “PennDOT Replacement of Route 581 Bridge during Weekend.”) For those listening in, the chance to ask technical questions of the presenters, whether live or after the fact, is priceless. Azizinamini also gathers together federal highway administrators, state engineers, contractors, representatives of fabricating companies and academics in his role as chair of the Accelerated Bridge Construction Conference, which is cosponsored by no fewer than 30 state DOTs and several federal agencies. The next conference takes place in December and will host more than 600 attendees who participate in workshops, listen to technical presentations and visit more than 50 exhibitors in downtown Miami. His long experience has given Azizinamini unique insight into areas of need within the field. Work he began at the University of Nebraska has led to his own inventions. By 2009 he had something — a folded plate steel girder system — that industry publications have predicted will revolutionize the short-span bridge market. The genius lies in bending a single steel plate into a trapezoid-shaped girder (several girders comprise the support on which a deck, or the driving surface, rests), thereby eliminating the conventional use of multiple plates that have to be joined by welding (the welded seam being a potential source of bridge weakness). The system uses less steel than do traditional steel girders, making it less expensive, and the innovative open-bottom construction allows for easy maintenance inspections, another cost savings. The girders are fabricated in a plant and delivered to the bridge site, where they are conjoined in preparation for the pouring of a concrete deck or the laying of precast concrete panels. CDR Maguire, a Miami-based engineering firm owned and run by FIU alumnus Carlos Duart ’94, MS ’99, markets and distributes the steel plate girder system. The unique design is key. Duart expects to see the folded plate girder system used to build 500 bridges by the close of 2022 and anticipates cornering 20 percent of the short-span market — or erecting 10,000 bridges — within the next decade. FIU holds a patent on the system developed specifically for bridges longer than 60 feet, and Duart says that will translate into a financial boost for the university in the tens of millions of dollars. While spearheading research and getting it to those in the field, Azizinamini is at the same time preparing the next generation of professionals. Currently eight Ph.D. candidates work in his busy lab. Azadeh Jaberi Jahromi is one of them. She spent a year as a Ph.D. student in the civil engineering department at a university out west before recognizing that her lifelong interest in bridges made that program a poor match for her career goals. Determined to take the risky and unorthodox step of changing programs midstream, she scoured academic journals and trade publications for inspiration. One name cropped up more often than others: Atorod Azizinamini. She sent him her research papers and made a visit to Miami. The strength of her commitment and the quality of her work earned her a spot on his team, and she has been getting her hands dirty ever since. (She studies deck and slab connections.) Jahromi revels in the comprehensive nature of her education under Azizinamini, who has an unparalleled grasp of how industry works. Upon graduation, she hopes to find a job with a private firm. And critical to making that leap: access to Azizinamini’s cutting-edge structural lab, where Jahromi and her fellow students can take experimental concepts from the drawing board to another level. That full-spectrum, hands-on experience gives graduating students a real advantage, a number of whom have scooped up high-level positions at top engineering firms, some even choosing among multiple offers. And would-be graduate students continue to apply at an increasing rate. That growing interest from young people bodes well at a time when Azizinamini is accelerating the pace of the center’s work, and the current U.S. administration considers directing greater funding to update the nation’s infrastructure.